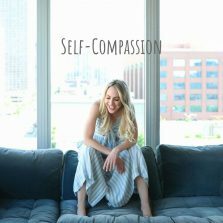 Self-compassion is the secret ingredient for successful weight loss & healthy eating. Research suggests that giving ourselves a break & accepting our imperfections is the first step toward better health. In one study, when researchers taught dieters to practice self-compassion after eating a donut they ate less …while the dieters who beat themselves up ate more. Practicing self-compassion helps stop the cycle of self-sabatage. Self-Kindness. Be understanding rather than self-critical. Common Humanity. View negative experiences as a normal part of being human. Mindful Acceptance. Acknowledge the situation without focusing on painful thoughts & feelings. “Don’t be hard on yourself. Nobody is perfect – especially with food. I overate & I don’t feel great about it, but I’m going to move on.